Although it's hard to pin down our very favorite summer activity, one would have to be our afternoon with the Black Stallion Literacy Project. I was unfamiliar with the program until it was brought to the HoneyBear Tree Preschool at our church and my children attended with other children from the community. The Black Stallion Literacy Project (BSLP) is a program that is well represented around the front range in Colorado, but extends across the country from it's roots in Florida. "The Black Stallion Literacy Foundation is an innovative partnership of educators, businesses, volunteers, education foundations, and staff members focused on promoting literacy through the winning combination of live horses and books by Walter Farley. 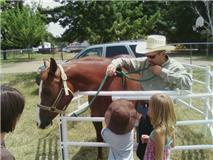 The program is based on the classic books of Walter Farley and the natural connection between children and horses." The BSLP offers programs for schools and in communities. Currently in Colorado, there is a campaign to find more volunteers so that BSLP can continue to grow, thrive, and reach more children. Children, books, and horses... I can't think of a better combination to spark a love for learning! The school-aged programs are targeted at 1st/2nd graders and 4th/5th graders. Community programs are geared the same way and can be used for after-school programs or summer camps. Our experience was top notch! 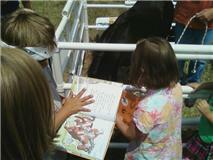 Each child received two hard-backed books, wonderful instruction on horse care, and plenty of time to pet and read to the horses. Safety precautions were handled with excellence and there were smiles and giggles all around! If you're interested in getting more information on volunteering or getting BSLP at your school, you can contact Cynthia Richardson: (303) 652-1442 or cynrich213@aol.com.